Typical fermentation vessels require a rather complex fixing of head plates with many and very closely spaced ports and screws. Heavy head plates are expensive and the accessibility of all ports on their top is bad, especially in the case of low volume vessels. A new head plate is necessary for each vessel of different volume which leads to high additional costs. Threads of ports in head plates are shallow. This, together with the well-known o-ring flattening after sterilization, leads to contaminations. Head plates on low volume laboratory fermenters/bioreactors have been simply scaled down from larger fermentors. This was not a very good idea. On small vessels the head plate diameter is so small that it needs a person with really small fingers to be able to fix or loose any part on it. The number of ports is also limited. The plates are heavy and therefore are made quite thin which leads to the difficulty of making the connections tight. The typical technical solution consists in the use of o-rings. O-rings of different sizes are used for the different ports and they must be quite thin. Because of their flattening during sterilization they frequently open a way to contaminations. Thus, they should be replaced before each run. 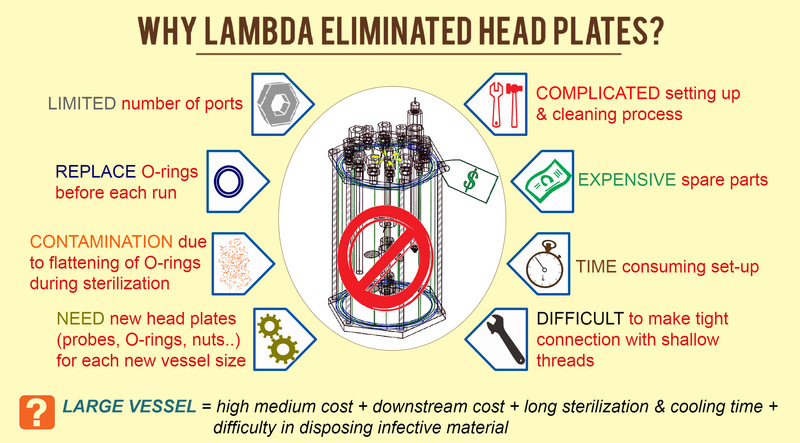 To setup a fermentation vessel with head plates takes much time and each vessel size requires a new head plate but also longer pH and pO2 probes, antifoam and temperature probes and practically everything on the head (O-rings, nuts, lead-throughs,...). This is extremely expensive. 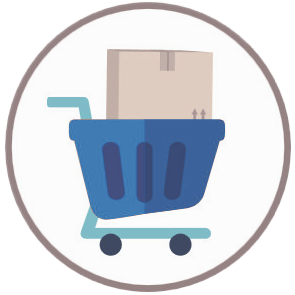 Therefore, very often researchers decide to buy the vessel of largest volume to spare investment money. However, working with higher than needed volume is also very expensive and cumbersome. It involves higher medium costs, longer sterilization and cooling times, larger downstream costs and the necessity of disposal of larger amounts of infective material. Large vessels are heavy to put in and take out from the autoclave and their manipulation is definitely problematic for many women, who represent today a large part of laboratory equipment users. 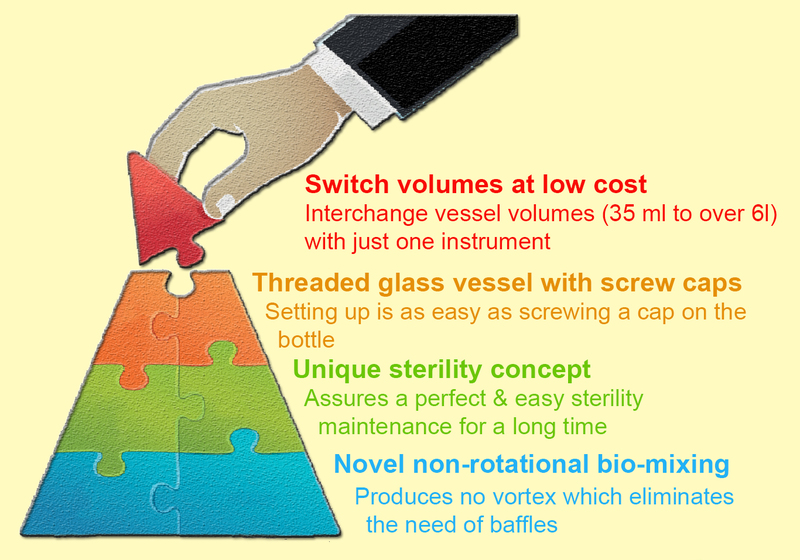 It is the best to use the minimal necessary vessel volume for laboratory scale experiments. It has many advantages and we can only recommend it.